Tru here. 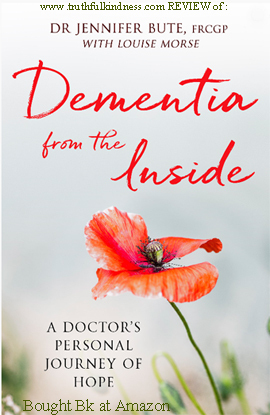 I think “Dementia from the Inside” , written by Dr Jennifer Bute (with Louise Morse) is helpful for anyone open to Christian perspective who is involved in any way with Persons with Dementia. Like many others who are now experiencing dementia symptoms, I wish that I could have had this “inside perspective” of more deeply understanding dementia symptoms, much much earlier. For me, understanding better could have enriched my relationships with two grandmothers who had dementia. Together we could have extended the time of verbal communication, as well as assisting with non-verbal communication. That is a big part of why I write a blog, and here is an excellent BOOK to assist others in those relationships. An added impetus, for me, is better understanding a wonderful mentor for myself, Jennifer Bute. Looking forward to our next video chat, my friend. – Truthful Kindness. .*. … .*. … .*. More Details on Book .*. … .*. … .*. Tru here. I bought paperback version of this book thru publisher, then kindle version thru Amazon. Took a while to read it thru, but the book is broken into smaller sections, and i used Kindle tools to make it easier for me. Very VERY glad i invested funds, time and energy in this book. It is a treasure. Perspective is key issue for how any person deals with dementia symptoms or diagnosis, so Jennifer begins her book with her own perspective; largely SPIRITUAL perspective. We have not spoken of it much (or i have fogotten), but discovered both Jennifer and i have the unusual theory that as cognition becomes more limited, the person with dementia often becomes more aware of the spiritual realms of life. in this book, Jennifer speculates that this may happen because inhibitions or social assumptions are removed. “If I’m confused, reassure me, but don’t overwhelm me with words — show me what I should do.” — Dr Jennifer Bute in “Dementia from the Inside”. Enabling Speech is one of my favorite sections of this book, where Jennifer says, “I have found there are five main ways of helping those in the later stages of dementia to talk, when others assume they no longer can — it is such a joy! The key words here are music, singing, laughter, and parallel and convergent speech.” … and she goes on to describe the techniques. “1 There is always a reason why a person is behaving in a particular way. 2 When facts are forgotten, feelings remain. This book clearly shows that there can be meaningful, joyful life WITH dementia, and gives suggestions of how to either live that life, or assist others in living that life. Wise investment of funds, time, and energy. * Admin issues: SHARE dementia awareness thru buttons below. Feel free to leave your thoughts in the form of comments, but please filter your comments with truthful loving kindness to all concerned. If interested in receiving notice of future blog postings, subscriptions are available through a “follow” button in the upper left corner (MS Explorer) or lower right (Safari, Mozilla Firefox and Chrome). If there is an advertisement below, I have no control over what is shown. My own full legal name is Truthful Loving Kindness. My current diagnosis is still Mild Cognitive Impairment, but my neurologist said I am in a unique position for helping because I have “one foot in each door”. Text Copyright © Truthful L. Kindness 2019Jan14 (altho Jennifer has copyright for all quotes on this page). Tags are: book, dementia, Jennifer Bute, PLwD, strategy, symptom. This entry was posted in Contributions from Others, Reviews and tagged book, dementia, Jennifer Bute, PLwD, strategy, symptom. Bookmark the permalink.